One of the ways that progress can be made on researching a family history is to try to find others researching the same line. This would enable research to be shared. So, check my family tree at Rootsweb World Connect and compare my genealogical tree with yours, to see if we have ancestors in common. In January 2011 it became a more detailed version, which includes fewer individuals, but provides census information. My Photo Album also has information about some of my ancestors and their connections with certain parishes. The PARKHOUSE surname occurs in clusters across Devon. My cluster is centred on Upottery, Devon. I have devised a web page including Steve Parkhouse's cluster maps. The hope is that if you are able to trace your PARKHOUSE ancestry back to one of these PARKHOUSE clusters in Devon you would wish to be linked to queries about that cluster. My father, Edward Stanley George Parkhouse (Stan) was born in 1906 and died early in 1985. The year before he died he wrote down his memories of his early life in Somerset and Glamorgan. Two extracts are included here in Adobe Acrobat format (PDF).. One is entitled Early Years which covers 1906 to about 1920, the other he called Dusty Decade covering about 1920 to 1930 dealing mainly with his life as a miner in the Aberkenfig area. (The title Dusty Decade was given by him to the whole document, as well as one section). I have a particular interest in the following families and would welcome more information and/or an e-mail if you have a connection. Isaac Parkhouse transported to Van Dieman's Land! My earliest proven PARKHOUSE ancestor is Jacob PARKHOUSE, a mason, who married, 2 March 1772, in Upottery, DEV UK. He was born about 1750. His baptism is possibly that of a child called John, baptised 26 March 1749, in Upottery, the son of John and Betty PARKHOUSE (nee JEWELL). Any information touching upon this, and where he might have lived, would be especially appreciated as I have been stuck for many years. Anyone who has a connection back to William and Harriett PARKHOUSE of Pontypool MON, shoemakers, who had at least 7 children (ref. 1871/1881 census), might be interested to know that I can show that William was the grandson of my Jacob PARKHOUSE mentioned above. This line has been traced back to the marriage, at Exeter Cathedral between "Robert Oke of Topsham and Sarah Shapter of the same" 28 March 1722, but more information would be welcomed. 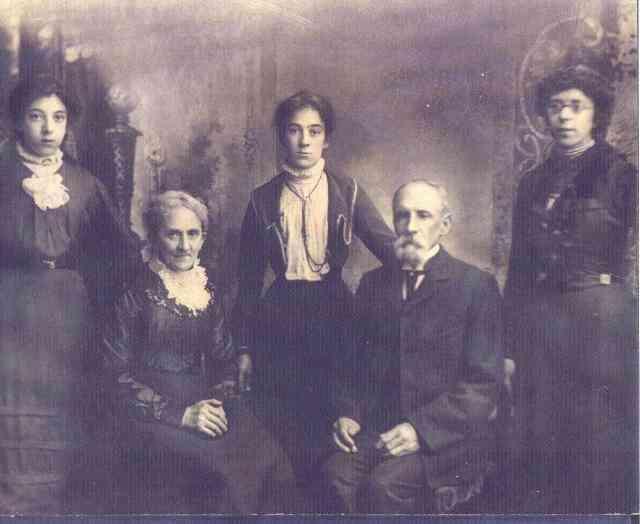 My Oak connection starts with the family of my great grandparents Lewin Thomas and Mary Oak (nee Crosse)shown in this photograph. Lewin Thomas Oak was orphaned at the age of 17 as related in this document written by his sister's daughter, Hilda Eliza Fee. The other line in which I have a particular interest is BASS. Until recently, my earliest proven ancestor of that surname was Samuel BASS who, according to census information, was born about 1781 in Ratcliffe Highway MDX. He died 27 Nov 1868 in High Street, Topsham DEV and was buried 29 Nov 1868 in Topsham DEV. He is recorded in the 1830 Pigot's directory as living in Topsham, his trade being a basket maker. When Samuel married for the second time, in 1842, his marriage certificate records his father as being Thomas BESS, baker. My grandfather, William James Bass (Bill Bass), told me, in the 1940's, that he was related to the BASS's in Lympstone. The Lympstone Society's website confirmed that there were BASS's in Lympstone. Bass Update - A breakthrough! More Bass Research In 1863, my great grandfather, John Bass, was fined 10 shillings for trespassing on the "spire" (reed) beds in the river Exe. It was reported in Trewman's Exeter Flying Post. My Crosse research really started from the information contained in this page from a copy of Bunyan's Select Works which I inherited. Samuel and Sarah Crosse were my 2xgreat grandparents. Samuel was a wheelwright in Somerset UK. 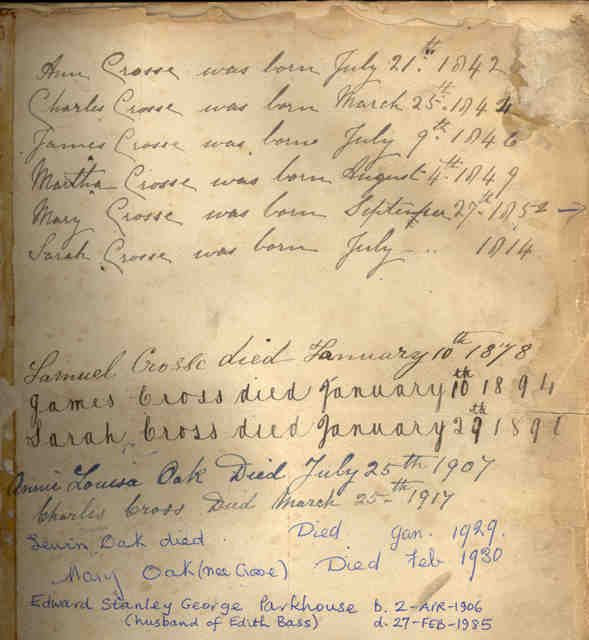 The first five names on the page are those of their five children, the youngest being my great grandmother, Mary Crosse. I imagine that Sarah wrote the first six lines on the page: the births of her five children and then her own. Perhaps Mary Crosse entered the date her father died and her husband, Lewin Thomas Oak, wrote the next two lines for the death of Mary's brother, and then her mother. When Samuel died, 11 January 1878 according to the death certificate, at Stathe near Stoke St Gregory in Somerset, Mary had only been married four months and was living in Cardiff, yet she was able to be present when he died. After her husband died, Sarah Crosse (nee Coram) continued to live in Stoke St Gregory for a time because the 1881 census shows she was living there with her 14 year old granddaughter, Emily Bass. (The daughter of her eldest child, Ann, who married James Bass. This Bass line is centred on Willand in Devon and appears not to be related to the Lympstone Bass's). 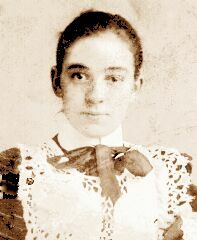 Later, Sarah moved to Cardiff and died there 29 January 1890.